#RPGaDay2015 snuck up on me this year. I was literally on vacation when it kicked off and it took me a couple days to get myself in gear, hence the big catch-up post on the 10th. After briefly toying with doing more batch posts as I saw some other folks doing, I decided I had the time to go for a post a day. Sometimes that meant banking a week’s worth in advance, and hoping that I had still had enough oomph to make the last post of the set interesting. I still felt as though I kept hitting many of the same games and things as last year, but I did come to appreciate how Dave Chapman switched up the topics and made them less about what stuff one bought. And again, thanks to Dave for organizing the whole #RPGaDay2015 experience. He puts the prompts together, gets the word out there and this year brought in some very cool guest commentators who might not have otherwise participated in the conversation. Additionally, I got a charge out of seeing bloggers and designers I follow participate. Made me feel like we were part of a tighter-knit community. And I got to discover new cool people to follow, like Casting Shadows — which I was doing anyway, but his YouTube channel deserved its own shout-out; it’s as though he ran two blogathons at once. After all that, I’m feeling more invigorated about role-playing games than I’ve felt in a while, as you may have been able to tell by the wealth of card game-related posts and videos that have gone up over the summer and spring. There’s a new campaign on the horizon for me and while I don’t plan to recap it as I did Carrion Crown or Skull & Shackles, perhaps I’ll find some inspiration there to write about exploring a new character type and mindset, or discovering the dynamics of a group of players all over again. And as we wrap up #RPGaDay2015, the final prompt turns my thoughts toward what role-playing has done for the wider world. My answer would have to be: people. Think about it. Role-playing games teach us problem-solving. They teach us empathy, both for characters in the game and for players at the table we might not have known otherwise. They teach us to collaborate, to utilize the available resources in the most efficient way possible, to build a shared narrative out of wildly disparate parts in a way that is — ideally — inclusive and constructive. In the best case scenario — and, I think — in most scenarios, role-playing games teach us to be better people. Empathic, inventive, constructive, literate people. That’s a win every way you look at it. And that’s #RPGaDay2015! Thanks to everyone who came along for the ride, commented, shared their own experiences and made the journey so much fun. Thanks especially to Dave Chapman, the mind behind Autocratik and the #RPGaDay blogathon movement. He puts the prompts together and led the charge with a vlog series that brought in publishers and designers to participate who might not have had the capacity to engage in the full course of the month. Certainly the RPG website I visit the most is RPG.net. It was one of the first I stumbled across when learning about role-playing games and its reviews database at the time had a strong influence on how my library grew. I still visit it regularly — multiple times a day, in fact. For a long time, though, that custom of frequent visits has felt akin to turning on the television to make noise in the house: you get more comfort from the constant background buzz than you do any significant gain from the content there. Like any web forum, there are perennial topics that come up again and again. It’s almost reassuring to see people continue to bicker over whether role-playing games are dying and whether game publishing is an industry or a hobby. Instead, I’ll give a shout-out to d20pfsrd.com. A dedicated team of Pathfinder fans did an amazing job of taking the game’s system reference document and to host it the Google Sites platform with a breathtaking amount of cross-referencing. It’s absurdly easy to jump from one related topic to the next because how of thoroughly game terms are hyper-linked. They use a “linkifier” script to recognize the use of a term that needs to be linked, and run it through what must now be thousands of pages. Those thousands of pages are ridiculously up to date, too. As Paizo releases more open content, the d20pfsrd.com team industriously brings it into the site. That website is such a huge boon to sifting through the maze of options that has sprung up around playing a Pathfinder character. I can’t recommend it enough to someone trying to figure the mechanical part of a character they’d like to play. Merging games together is something I have a real taste for. I spent way too much time working on blending The Madness Dossier with GURPS Cabal to make Broken Spokes. Another mash-up idea I am fond of is the Madness Conspiracy, dropping Conspiracy X‘s AEGIS on the frontlines of the struggle against the annunaki of History-B. Bringing Dennis Detwiller’s Gilchrist Trust in the WitchCraft universe would be cool, too. It can’t be anything but Suppressed Transmission. We’ve talked about this Pyramid column of Ken Hite’s before. I agitated for the release of the still-uncollected bulk of the corpus. Regrettably, nothing came of that, which is a crying shame because what was published was so damn good as an idea mine of utter weirdness to build into your game of choice. There have been spiritual successors, like Matthew Rossi’s Things That Never Were, a collection of essays that feel like they could be a Third Broadcast, right down to using the neologism “bisociate.” Hite went on to write a similar-sounding series for a Swedish magazine, and then kicked off Ken Writes About Stuff for Pelgrane Press, which was rather more mythos- and GUMSHOE-focused when I was subscribed, but it still felt like kin to Suppressed Transmission. 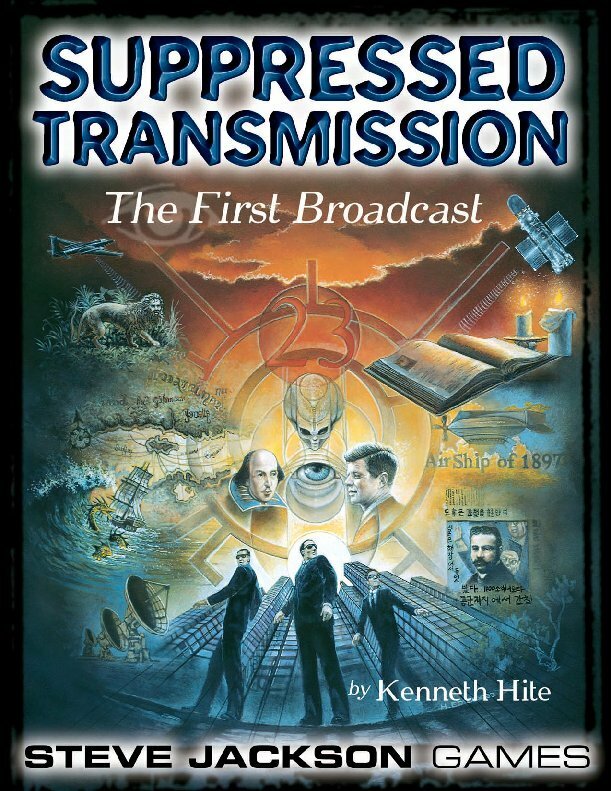 Pound for pound, though, Suppressed Transmission is where it’s at for finding all kinds of crazy ideas and oddities of real world history to seed into your games, whether they’re modern gonzo conspiralunacy or a traditional fantasy campaign in need of some new, previously unknown monsters and antagonists. Someone out there has to have taken up Hite on his suggestion of Justinian I as a demon, right? I’m not sure I can answer this one. Any mechanic I like that one would call revolutionary is probably old enough that it’s been outdone in terms of radical innovation several times over by newer games. Instead, I’ll talk about a mechanic that I really like. It probably wasn’t the first, it certainly wasn’t the like, but it’s the example that I know and like. Angel included a system for designing an organization for which the characters would work — or own; as you’ll see, the system was designed to be flexible. The GM grants an amount of points, to which the players can contribute some of their own character build points, and the players distribute points into their organization’s spheres of influence and their place within it. The two extreme examples are Angel Investigations and Wolfram & Hart. The first is a group whose players put their points into being in charge. Angel Investigations has minimal clout in Los Angeles and runs lean, without many resources to call on. But the characters are in charge, damnit: they answer to no one but each other and set the direction for the company. Alternately, Wolfram & Hart’s players clearly dumped all their points into contacts, resources and clout. The firm exerts influence on multiple planes of existence, its facilities seem limitless and people generally quake in their boots when J.Q. Cheatem from Wolfram & Hart shows up with a sheaf of papers in hand. On the other hand, to get their law firm to that level of status, the players have put themselves at the very bottom of a very tall pyramid which is capped off by three or more demigods of uncertain though certainly worrying levels of power. So there’s a wide spectrum to work within when designing your organization with Angel‘s mechanic. I really dug that, and regret not having had the chance to put it into play yet. Giving the players that level of control over the campaign framing device should really get them engaged with not only their character’s development, but the course that organization takes over the span of the game. My favorite house rule would have to be the one that I don’t even think of as a house rule. When we played Carrion Crown, the GM instituted a house rule that each round, a character could drink one potion as a free action. Doing so simplified play, made potions a slightly more appealing option in the tight action economy of Pathfinder and became completely invisible. In short, it was the perfect sort of house rule. I feel like most of the games I’ve cited during #RPGaDay2015 — and in 2014 — have been the perfect games for me. They’ve got the right amount of rules to bother with, an appropriate sense of whimsy without being absurd and a premise that makes me want to play. That’s about all I need to be happy.